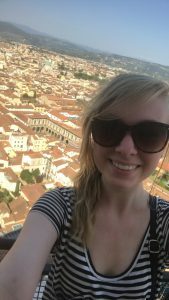 My SAI moment happened as soon as I landed in Florence. 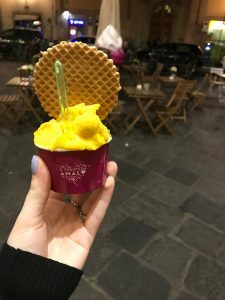 Here I was in a foreign country, alone, my Italian phone wasn’t working yet, my luggage got left behind at my connection in Paris, and I was so lost on what to even do. I didn’t follow the number one travel rule that says “always pack your tooth brush and an extra change of clothes in your carry on. I had to sprint through the Paris airport where my connecting flight to Florence was because my plane landed late and I had 40 minutes to get through customs and security in an airport that I knew nothing about. Missing my flight was my worst nightmare. I made it! But my luggage didn’t… Once I got to Florence I was ecstatic to be in my new home for the next 6 weeks and I already knew what outfit I was going to put on before I roamed the streets of Firenze. When my luggage didn’t come around the carousel, I knew I was about to have a stressful day. I stood in the cramped baggage claim area for close to four hours (everyone lost their luggage on my flight so there was a mile-long line) thinking my luggage would be on the next flight. My roommate who I had been in contact with before getting to Florence landed and went out to tell the SAI crew waiting at the airport about what was going on. Thank goodness I had an international plan on my American phone so I could text with her. After having one of the most stressful four hours of my life, I finally left the baggage claim area and there SAI was with huge signs and they were so happy and welcoming. I told them everything that happened and they were so supportive and told me everything was going to be alright. They explained that my luggage will be sent to the Florence SAI Office and that they will let me know as soon as it arrives. The next day, I was wearing my roommate’s clothes (bless her heart) and we went to the welcome aperitivo. The SAI office was closed, but they were nice enough to open the office back up so I could get my luggage and finally unpack! I had to represent my school in front of Florence! My first couple hours in Florence may have been rough, but SAI has an amazing support system and I knew I was in great hands. 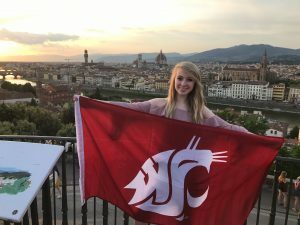 Carly was an SAI Florence summer 2017 student from Washington State University. She is also an SAI Ambassador.